No matter the reason for your Waiheke Island break, Whisper Cottage offers everything to restore, relax and rejuvenate. Looking for a romantic interlude, respite from the city or a pampering time with friends, we have you covered. A thoughtfully appointed cottage with well-equipped kitchen, cozy living, 2 spacious bedrooms with King sized beds, large out door Spa Pool and complementary 4wd. The cottage is nestled amongst native bush offering complete privacy while enjoying stunning northerly views over Onetangi Bay. • Passenger ferry from Auckland City arrives at Matiatia Wharf. • Upstairs bedroom has 1 king size bed and 1 king single. • Beds are made up ready for your arrival. • Sky TV Basic package and wifi. • Ample heating including 2 Heat Pumps. Car displayed is included in the quote given. All drivers must be 25 or older with a full license. The car is for use on Waiheke Island only. Children are welcomed age 7 and above. from where the car is parked. This may be a problem for our mature guests travelling with luggage for longer stays. 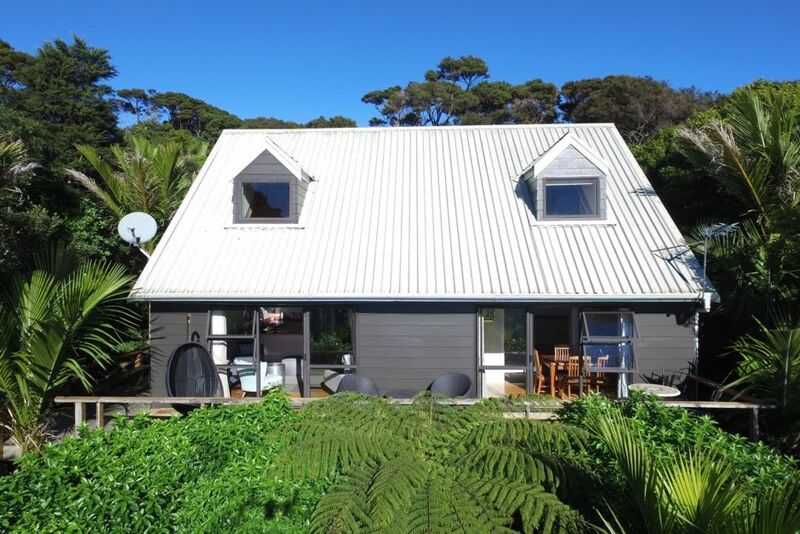 Whisper Cottage enjoys fabulous north facing views out over Onetangi Bay. Wonderful home away from home. Beautiful setting and amazing views! We had a fantastic couple of days away. The bach was scrupulously clean and has everything needed for a very comfortable stay, with the added bonus of a hot tub and car on loan. Peter was great to deal with throughout the booking process, and had great suggestions for our time on Waiheke. Wish we had been able to stay longer...hopefully next time! Overall good stay. Beautiful view, nice kitchen. Hot tub was wonderful after a hike. Road and street parking a bit difficult to navigate and sometimes stressful, but part of staying in a remote place. We did have a major mosquito problem that kept us up all night our first night there--the window upstairs had been left open by someone before us without our knowledge. I would avoid opening any windows and bring bug repellent if you plan to sit out on balcony. Lovely bach with bonus car to get around. Super comfortable beds and well stocked with kitchenware. Very peaceful and private place. If you want a secluded spot, set in bush with north facing views then this property is great. The 36 steps up to the cottage are challenging, especially for older people carrying luggage. Then there is the 14 steps up the spiral staircase to the upper level bedroom, also a challenge. The cottage was very clean, tidy and the facilities great. The spa pool is an added bonus and I enjoyed sitting surrounded by the bush looking up at the stars. The deal includes the use of a car which you definitely need to get to this property. Parking is on a very narrow road and you can not enter or exit the car on the left side when parked. This really is a wonderful place to stay. It is extraordinarily well equipped, comfortable, stylish and spotlessly clean. The view is quite amazing and you really are surrounded by bush yet close to everything that Onetangi has to offer. Use of a car is an added bonus. Peter is an excellent communicator, a true super host! Great Spot. Very quiet and lovely views. Great Spot. Very quiet and lovely views. Very well equiped. Will be back. Whisper Cottage is very well positioned to access Waiheke Islands Eco zip, Onetangi Bird and Forest Reserve and Peacock Sky Vineyard.